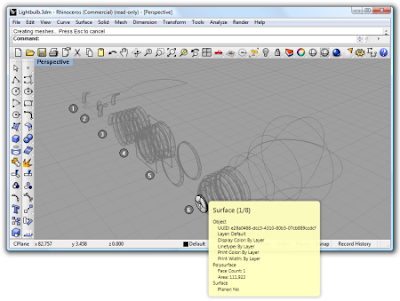 Bubble for Rhino, developed by Asuni CAD, is a free tool that displays a tooltip with information of any object in the document. You don't need to execute a command or click on a button toolbar, just place the mouse cursor over any object, wait a second, and Bubble will show you all the information related to it. You can even choose which information will be shown for every object type.